Why did they base Axel so heavily on Reno? Has anyone heard anything about the decision to base, both visually and his early personality, of Axel/Lea so strongly on Reno from Final Fantasy VII? Also, do you think that Axel and Saix's relationship is similar to that of Reno and Rude (ei. the wisecracker and the bruiser)? Nomura was just being experimental. He already had Disney characters, original characters, and Final Fantasy characters, so he just wanted to try his hand at an expy. Why Reno specifically though? I'm not exactly an expert on FFVII and Nomura's history with it, but if I had to guess, he probably just really liked Reno. I've only played about half way though VII and saw Advent Children, but from what I've seen, Axel's/Lea's and Saix's/Isa's dynamic is completly different from Reno's and Rude's. I'm not sure, but I liked the way Axel turned out. I think I also somewhere on here a while back that Sora was loosely based on Sion's design from The Bouncer. That one seemed even more interesting to me. There's never been a mention of Sion that I know of, but Sora's KH1 design was based off of Mickey's as a spiritual representation of him because he couldn't be included in the story as much as the staff wanted because of legal reasonns. Well the Sion thing may have certainly been fan speculation due to their similarities (I mean, the similarities are there), I just know that after I read about it it has always stuck out to me. I'm sure you know more about it though than I do regarding who he was based off of, I've never heard of him being spiritually based off of Mickey, but I can certainly believe it. The Sion thing is purely fan speculation, but I think the Mickey one might be one too. I've never seen it mentioned in anything official, anyway. I want Sion to be KH so badly. All the funny that could happen... Heck, Sion sounds exactly like Xion. He can be used to have Sora learn Xion's name. As for Sora being based off of Mickey, isn't it because Square wanted Mickey to be the main character while Disney, Donald? Then, Nomura came up with an original character which we now know as Sora. 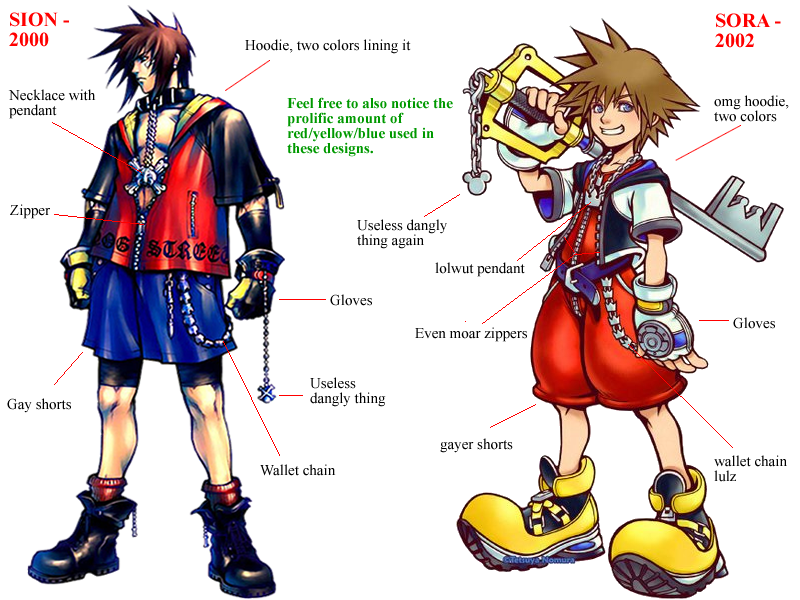 Several aspects of Mickey were present in Sora's KH1 outfit, such as white gloves, red pants, and yellow big-as-heck shoes. That's if I remember correctly (and I could be wrong), but I do recall reading something like that somewhere. Probably even within the forums. I wonder how many people have even heard of The Bouncer? I heard about it from reading the web comic Manly Guys Doing Manly Things. I found the game at a Gamestop couple years ago...still new...still $50... I don't think they even knew they still had it. The sticker was so old, it was in with the used games but... *sigh* I was in such a rush I just gave them the money. Afterwards I realized I probably could've haggled. I kicked myself over it for a week. I do love the game, though. Anyway, yes, I agree that they fit in the KHverse rather well. To this day I wonder what would have happened if we had no Sora and the games stared Mickey or Donald instead. It certainly would've been different. Disney wanted a Donald game. Square wanted a Mickey game. Nomura said "diddly both of y'all" then made Sora. Disney said okay, but he had to ditch the chainsaw. It's a beautiful story really. but he had to ditch the chainsaw. Man, I wish I had been in that meeting when he showed that sketch. Really a pretty brilliant design dynamic on Sora, Riku and Kairi all three. The big feet, puffy pants (for Sora and Riku) and big anime eyes make them very child-like and non-threatening, perfect for a Dinsney-based game, yet they still look cool and have that Square Enix look. Sora's movements and fighting moves also walk that line. Excellent job of tightrope walking IMO. You're actually making me tear up, stop that! I've heard about it in the mid-2000's, but that was several years after it was released. I've been searching for that game ever since then and I never did find it. :/ Anyway, if they can bring Sion himself and some of the other characters in, that would be awesome. With that in mind, has anyone here ever heard of a game called Illusion of Gaia (a.k.a Illusion of Time over in Europe)? It's an Enix property that has potential for III for those that are familiar with the story. Will, the main character, can also work very well as a party member (whether he's beating up enemies with his flute of all things, or as Freedan or Shadow). And let us not forget about Dragon Quest and Parasite Eve. Totally! Especially characters from older games. Nope, never heard of it. But now that I have I WANT IT! !